BEST FACE FORWARD: Candidates are increasingly creating Facebook pages to connect with constituents and provide a little more insight into their positions on the issues. Some candidates also use Twitter to post short updates about fundraising events or endorsements. Those candidates using social media say they’ve connected with the community in a way they couldn’t otherwise. Political hopefuls have always seized technological advances to get an edge in their campaigns. JFK did it with television. More recently, President Barack Obama’s team executed a social media strategy largely credited with bringing mass voter attention to his message of hope and change. Considering the results—Obama is in the White House, after all—it’s no wonder the virtual momentum has spilled over into local governmental races, providing candidates with a better way to communicate with voters. Or not. Katcho Achadjian, a candidate for the 33rd Assembly seat, relies on digital communication to a large degree. Running a campaign and attending to his Coastal Commission meetings and other responsibilities as a SLO County supervisor often take him out of town. 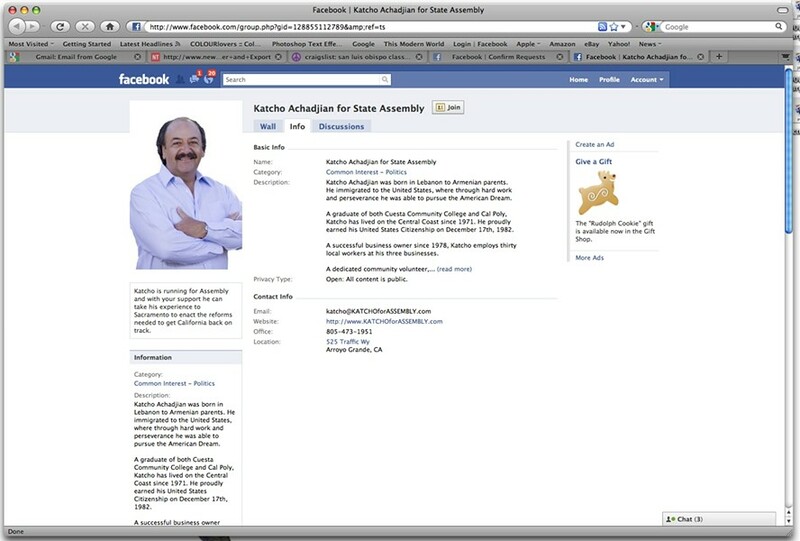 You’ll find him keeping tabs via his Blackberry, and his Katcho for Assembly Facebook site attracts 50 to 100 followers per week, he said. Achadjian said his Facebook followers will often read an article about this or that issue and ask questions of his campaign people online, where staffers are able to deliver answers. It helps the team to easily connect with many people in a way that would otherwise require a full-time body to set up meetings or return phone calls. That access isn’t always a good thing, he admitted. It can be informative, but also distracting. Fellow 33rd Assembly District candidate Hilda Zacarias got on board with social media during her first campaign for Santa Maria City Council. 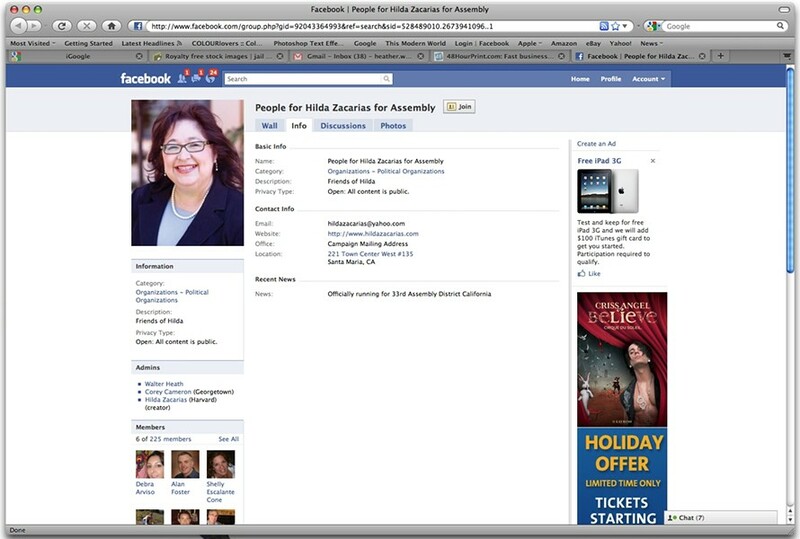 Zacarias has both a personal Facebook site as well as a “Hilda Zacarias for Assembly” fan site. And though her team does help her with upkeep, she does much of it herself. While she was being interviewed, Zacarias proved she wasn’t joking, as she perused her Facebook status. So far, Zacarias is concentrating on Facebook and her website. She’ll join Twitter, she said, when she hits the campaign trail and has a lot more to update. Sites like Facebook, Twitter, and the like continue to grow in popularity. Facebook boasts about 400 million active users, with half of them logging on every day, according to Facebook’s stat page. About 20 million people become fans of Facebook pages—establishing a connection with the person, business, group, or idea highlighted there—each day. Other sites, like Twitter, have been harder to nail down, demographic-wise, primarily because users often access them through outside applications like their mobile phones. Royal Pingdom, a blog about the Internet and web development that provides services monitoring the uptime and performance of websites, reported that Twitter was home to 1.2 billion tweets in January—significantly more than even just a few months prior. It’s expected that February will see 1.4 billion tweets. 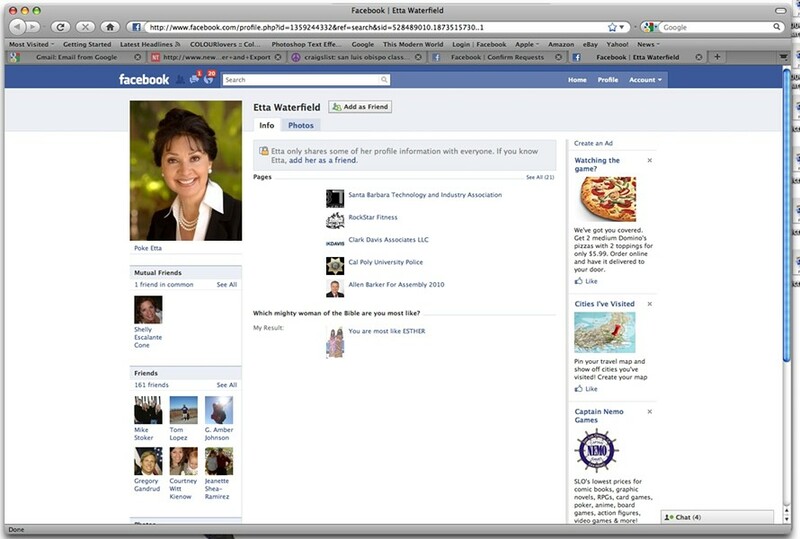 Etta Waterfield has already found social media to be helpful in her campaign for 33rd Assembly District. Her online presence helped her not only secure supporters—it landed her a campaign manager as well. Before she joined Waterfield’s team, Heather Moreno of Atascadero Googled the candidate’s name and found her website. She liked what she saw and invited Waterfield in for an interview with a group looking for a candidate to support. Since then, Waterfield has been active on Twitter and Facebook, keeping up her posts with the help of her team every day. People ask questions, but they also send articles or information they think might help Waterfield’s campaign. Despite her success with social media, however, Waterfield said there’s no substitute for one-on-one interaction. Opponent Fred Strong disagrees with the need for social media in a political campaign. As mayor pro tem of Paso Robles, Strong has to consider his day-to-day duties, as well as the citywide, regional, and statewide committees he participates in. Social media simply requires too much time, he said. He does have a website, though, which he uses to get his message across. And he hands out a 38-page book that talks about his political stance and includes excerpts of testimonies he’s given during his career. Strong said social media only has value if a candidate is really reaching people he needs to reach—and if those people are actually listening. Matt Kokkonen is also running for the 33rd Assembly seat, and he’s aggressively using social media to grab the portion of voters who interact in that space and to catch up with the other candidates, considering Kokkonen entered the race later than most. Using Facebook, Twitter, MySpace, and YouTube—as well as incorporating e-mails and newsletters—the effort seems to be getting favorable responses, said Kokkonen campaign consultant Andrew Russo. “This is an era in which the idea of a website needs to be more than a static brochure,” he said. Along the way, Kokkonen’s team has learned a few things, such as: People tend to watch the videos rather than read the e-mails or newsletters. Overall, however, response has been positive. 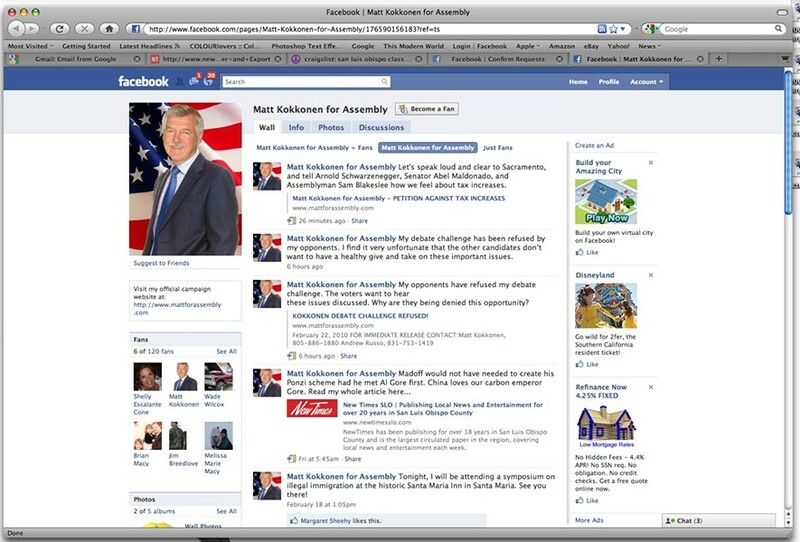 They’ve also incorporated a strong search engine optimization program, so when you type in Matt Kokkonen for Assembly, a lot of hits show up. Not all candidates’ websites come up when you type in their name in a search box. “We have a very vigorous presence on the Internet, and I think it’s paying off,” Russo said. When it comes to the issues, not all candidates are utilizing social media to get their messages out. San Luis Obispo attorney Mike Zimmerman is what you might call middle of the road when it comes to going digital. Zimmerman, who is running for the Fourth District County Board seat, said he and campaign staff are currently looking into the possibilities of a Facebook and Twitter page to compliment his website. Zimmerman said it surprises him how few people use the campaign telephone number to ask questions and give comments. Social media, he said, could generate a little more communication on both sides. “Hopefully with these tools we’ll get more feedback and people can respond a bit easier. We want that feedback,” he said. Current County Parks Commissioner and Lucia Mar school board member Paul Teixeira, also running for District Four Supervisor, on the other hand, has yet to even post a website, but his Facebook page has been up for a over a week. Erik Long, Teixeira’s political consultant, told New Times that development for the website is underway, but in the meantime, the candidate’s Facebook page was something that could be done quickly and offers voters a glimpse of the candidate as a human being, as opposed to bombarding them right off the bat with detailed stances on the issues. Also in the supervisor race, Arroyo Grande city councilman Jim Guthrie got an early start when it came to new media. In addition to his website, Guthrie created a Facebook and Twitter page for his campaign, as well as an RSS feed, which automatically notifies subscribers of breaking campaign news. “At this point, we’re kind of just toying with it, seeing what kinds of things people respond to,” Guthrie said. With the large pool of candidates in the San Luis Obispo County Sheriff’s race—currently standing at eight—voters have a lot of research to do. Perhaps that is why most of the contenders realize the need to go beyond the limits of a standard campaign website and try to get as much information about their candidacy out as possible. 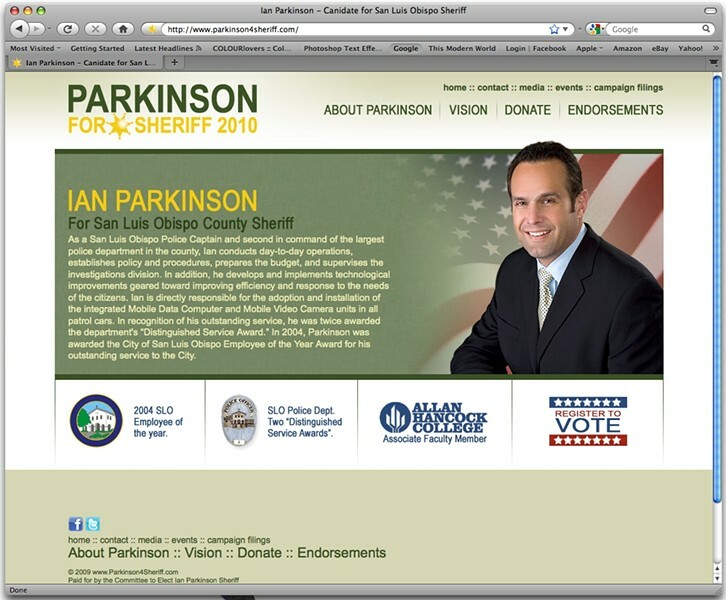 San Luis Obispo Police Department Captain and sheriff candidate Ian Parkinson has links to his Facebook and Twitter pages posted on his website. So far, Parkinson’s Facebook page has taken off, with more than 520 “friends” following his campaign. Current Sheriff’s Deputy Mark Adams, another candidate for sheriff, has also taken advantage of Facebook, Twitter and MySpace. Adams, who has no problem admitting he knows a thing or two about computers, is the only candidate who has created his own blog, a casual way to let voters know what’s on his mind and where he stands on the issues. Adams, who wraps up each day with about an hour or so on the Internet to keep himself informed, said social networking sites have become perhaps the easiest way to stay in touch with people and spread the word. Current Sheriff’s commander and candidate Ben Hall agrees. He, too, is all over the place: Facebook, MySpace, YouTube, Twitter. Although Hall said he was a little reluctant to immerse himself in the world of social networking at first, he said he plans to continue using it as a tool for communication even after the elections. Former Pismo Beach Police Chief Joe Cortez who’s running for sheriff is on board, too. Links to his Facebook and Twitter pages are found at the bottom of his campaign website. Cortez uses his Facebook wall to post public service announcements such as current scam alerts, as well as links to articles he has written about his vision for the future of the department. The consensus from the candidates seems to be that though you can’t replace personal interaction with the community, the benefits of the Web are too great to ignore, and many are taking the time to learn more about social networking options. 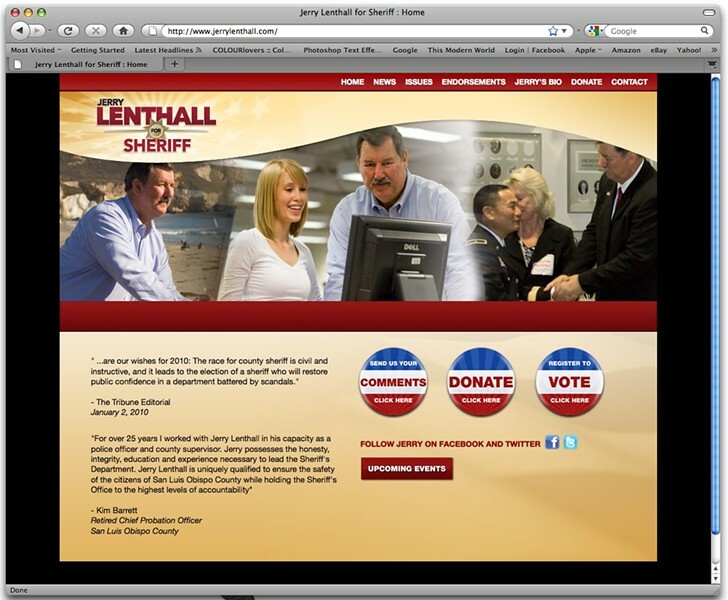 Former county supervisor and retired SLOPD sergeant Jerry Lenthall, who also has a presence on Facebook and Twitter, is one of those candidates. Not everyone is ready to hop on the wagon to trendy town just yet. Candidate Michael Teixeira is running his campaign through the word-of-mouth approach. The former California Highway Patrol sergeant does, however, have a personal Facebook page on which he posts announcements from his campaign. And though she’d be interested in a Facebook or MySpace page at some point, retired Los Angeles County Sheriff’s Deputy Marilyn Morris said for the time being, that’s not the kind of campaign she’s running, either. To set up and maintain a campaign website, she said, would require time and energy on fundraising and working at the computer. Time, she said, which could be better served elsewhere. Businessman Kevin Faircourt, who’s also running for sheriff, has been largely absent from the spotlight so far, and has yet to create a Web presence for himself. Calls to Faircourt’s listed number were not returned as of press time. Shelly Cone is Arts Editor for the Santa Maria Sun. She can be reached at scone@santamariasun.com. New Times staff writer Matt Fountain can be reached at mfountain@newtimesslo.com.